Recent US immigration policy changes have a lot of immigrants concerned — understandably so. Those policy changes removed some restrictions on the groups that can be removed from the country so more people are potentially affected. If you recently received a Notice to Appear, you’re currently navigating the deportation process, or you think you are at risk of deportation, it’s important to know what the steps are. Understanding the process can help you prepare appropriately. 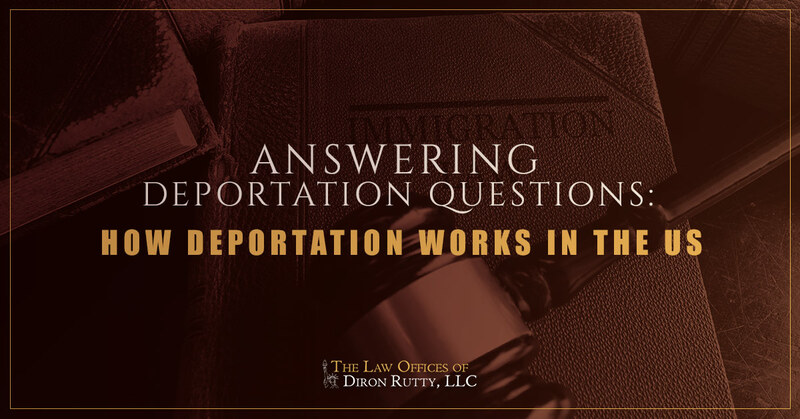 Learn more about how deportation works in the US and contact the Law Office of Diron Rutty, LLC if you seek deportation or immigration help. The first step in the deportation process is an official Notice to Appear from US Customs and Immigration Enforcement (ICE). The notice will provide at least 10 days notice to appear in court. Often, a Notice to Appear will come after arrest by local or federal law enforcement. The arrest can be in relation to a serious crime, but it can also occur if you are pulled over by local law enforcement for something minor, like a traffic violation. You may also be detained at a border crossing or at an airport when traveling. Please note, any individual facing deportation may have the help of an immigration lawyer throughout the deportation process, but the courts will not appoint one. It will be up to you or a loved one to find an immigration lawyer if you so choose. Those arrested by local law enforcement can be detained by ICE based on a security/safety risk. If individuals are detained within 100 miles of a US border and if they’ve been in the US for two weeks or less, they can be deported through the expedited removal process. Otherwise, a Department of Justice immigration judge will decide whether bond is necessary and set the amount. Like bail, the detainee can be released after posting bond. Some individuals are eligible to choose to voluntarily leave the US, referred to as voluntary departure. There are strict guidelines in place governing who is eligible for voluntary departure. However, voluntary departure can permit individuals to return to the US later under legal means. This short hearing determines how a case will move forward. An ICE attorney will present charges and the person in question will be asked to admit or deny each charge. The person in question will also have the opportunity to present a defense (called relief). Defenses can include asylum, marriage- or family-based petition, or cancellation of removal. An immigration lawyer can help determine which defense to present and how to support it. This hearing is when individuals can present their arguments for staying in the country. At the end of the Merits Hearing, the judge will decide whether the individual can stay in the US. The decision may be made at the end of the hearing or sent in the mail. If removal is ordered, individuals can request a delay of deportation to appeal the order. However, some individuals may be detained throughout the appeals process, even if they were eligible for bond. If you or a loved one is facing deportation, you don’t need to navigate the process alone. Get help from the experienced professionals at the Law Office of Diron Rutty, LLC. Contact our offices in the Bronx, Manhattan, or Poughkeepsie to get started.